This first example could be where every new image is set to that zoom set if locked. The second example is where every new opened file is locked to that zoom if the lock is clicked on. 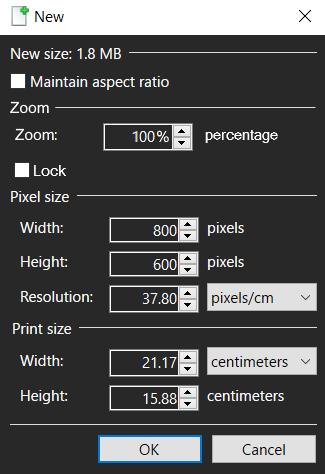 This would be useful if you maybe had a lot of 20x20px size images and you wanted to edit every single one for some reason but you had to keep zooming in on every single file. Maybe you could do this in Settings > Tools. I don't see the point when CTRL + mouse wheel is so easy to get used to. The other way I regularly zoom in is CTRL + B (zoom to window) and CTRL + 0 to return to the actual size. I made an account just to reply to this. I use Paint.net to do pixel art pretty much exclusively. I actually do find myself opening a lot of little files and was wondering if there was a way to set my default zoom to something like 1000%. I hate that zooming in with the mouse wheel uncenters the image, because often times I have multiple images I'm comparing to others, and so they need to be in the same spot as each other-- so I have to click and drag the zoom slider on the bottom every time. It gets annoying after a while. I would love if the second example plugin/feature was a real thing. Zoom in then hit Ctrl + B twice to recenter the image. It would just make things easier. so I have to click and drag the zoom slider on the bottom every time. Alternatively, hold Ctrl and press + a few times. A default setting to open images to fill the visible window space would be a solid option to implement, but it would be up to Rick.